Matoke is the green cooking banana that's a staple in Ugandan cuisine, paired with slow cooked peanut sauce, it makes for a uniquely tasty meal. 1. Peel the green bananas and plantain, chop into 1-2″ chunks. Juice the lemon into some water and rinse the bananas. Using a medium saucepan, add the bananas and bring to a boil until soft. Drain and mash with a pat of butter. 2. While the bananas are coming up to a boil, dice the onion, mince the garlic and sauté in some oil for a few minutes. 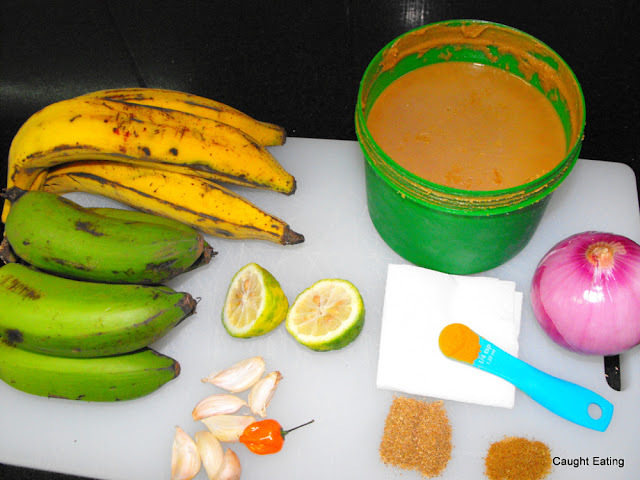 If using the chili, add it whole to the oil but remember to remove it prior to adding the groundnut sauce. Add the dry spices and sauté for 1-2 minutes. 3. Add the groundnut sauce/peanut butter and stir continuously. As the sauce heats up it may start to thicken back up again. Just thin it out with a little hot water or stock. 4. Serve a heaping of the matoke with the groundnut sauce over it. Garnish with chopped cilantro if you want to!